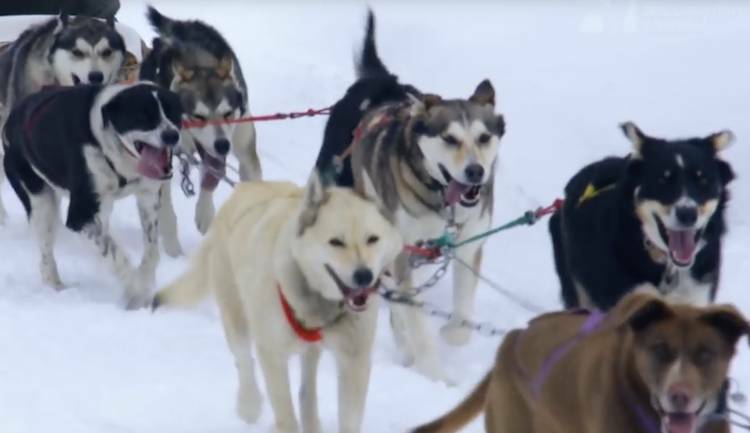 One former Iditarod trainer summed up the attitude toward the dogs of those taking part in the race: "They're like tools. That's all that they are is a tool." When not pulling loads across long distances, these dogs, often kept by the dozens, are stored like inventory, chained to metal posts, old plastic barrels, or dilapidated wooden "houses" in muddy fields. The deaths of sled dogs don't make headlines. When five dogs died in the last Iditarod, people around the world were rightfully aghast and appalled. But dogs who are forced to pull sleds—whether in well-known races or in private operations—routinely suffer and die, and these deaths don't make headlines. Their bodies are dumped into shallow graves (if anyone bothers to pay them even that small modicum of respect), and other dogs replace them on the towline. From Alaska to Colorado and throughout Canada, dogs used in sled races and in commercial sledding operations for tourists are treated like replaceable equipment. When not pulling loads across long distances, these dogs, often kept by the dozens, are stored like inventory, chained to metal posts, old plastic barrels, or dilapidated wooden "houses" in muddy fields. Breeders churn out these dogs, who will end up spending most of their lives at the end of a chain, denied any comfort or companionship. At the breeding compound at Ontario's Chocpaw Expeditions, the largest kennel in North America, a mass of dogs tethered to individual plastic barrels stretches as far as the eye can see. Each one lives at the center of a 6-foot circle of mud, restricted by a 3-foot chain. Some are driven insane by the confinement, repeatedly spinning in circles. 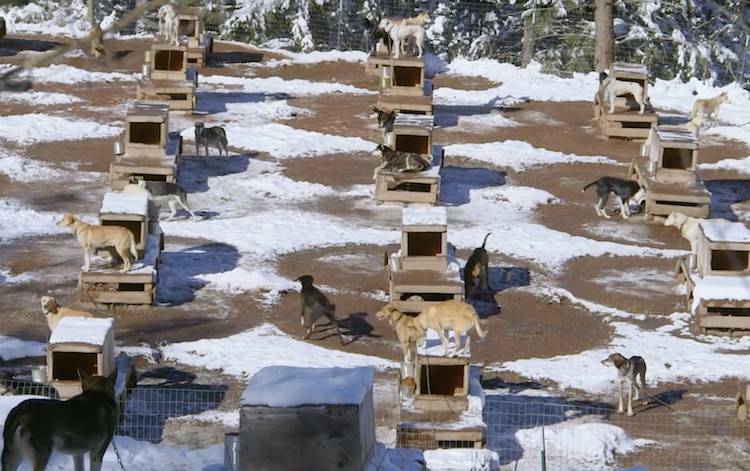 At Colorado's Krabloonik Kennels, the largest dog-sledding tourism operation in the United States, it was standard practice for "excess" dogs to be shot in the head and buried in a pit. The town's mayor staunchly defended the operation and brazenly refused to allow animal advocates to speak at town meetings. However, tenacious locals pushed the district attorney to take action, and a surprise inspection resulted in charges against the owner for eight counts of cruelty to animals. The owner sold the operation—which continues to operate today—to like-minded employees. A riveting new documentary, Sled Dogs, by director Fern Levitt, raises the curtain on the ugly, behind-the-scenes cruelty in the dog-sledding industry. Chilling footage shows obviously terrified dogs being forced to train. One trainer is shown dragging a squealing dog named Lydia by the neck, admitting that she was "totally afraid." As Lydia is being dragged past other dogs, she's attacked and bitten by one. The breeder then chains her in the mud, dismissing the incident and saying, "See, we're good." The same trainer is shown tying a weight to dogs and dragging them, frantic and struggling, by the neck. The dogs were so neglected that the trainer didn't even notice that one of them was dead at the end of his chain until the film crew spotted him lying motionless in the snow and pointed him out. Levitt's crew filmed dogs at the 2016 Iditarod who were exhausted, stiff, injured, and flat-out miserable. Some were too worn out even to eat or drink. In the footage, one musher is shown stuffing his dogs into tiny compartments in his transport truck to go to the training area. There, he drags them to the towline and forces them to pull his truck in the snow for 80 miles. The same musher balks at removing his sick, injured dogs from the race even after an Iditarod checkpoint veterinarian advises him to do so.